Verden, 1 agosto 2018 - At the Herwart von der Decken-Show, 18 three-year-olds with jumping genes in their pedigrees competed. 49 mares had most valuable dressage blood lines. Hann.Pr.A. FS Darcos Diva v. Darco de Revel/Cassini Boy Junior (breeder and exhibitor: Hengststation Ferienhof Stücker, Weeze) was the best show jumping mare. The expressive bay impressed not only with her boundless ability over the jump, but also on the triangular course. 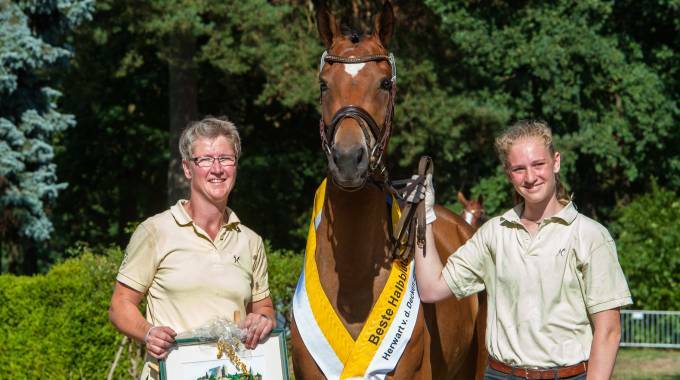 "She could also have competed in the group of dressage mares," Dr. Werner Schade, breeding and business manager of the Hannoveraner Verband said. Reserve Champion Mare was the Cornet Obolensky/Lordanos daughter Hann.Pr.A. Casablanca (breeder and exhibitor: Heinrich Ramsbrock, Menslage), who was hardly inferior to her predecessor. Judge Johan Knaap commented on Hanover's show jumper breeding: "All mares showed great overview and quick reflexes. We have seen many different international bloodlines in the pedigrees. This is very important for the future!"